According to experts, 80% of learning is visual, which means that if your child is having difficulty seeing clearly, his or her learning can be affected. This also goes for infants who develop and learn about the world around them through their sense of sight. To ensure that your children have the visual resources they need to grow and develop normally, their eyes and vision should be checked by an Optometrist every year. According to the Canadian Association of Optometrists (CAO) children should have their eyes examined by an Optometrist every year starting as early as 6 months, and definitely by the age of 3 prior to starting school. If there are any signs that there may be a vision problem or if the child has certain risk factors (such as developmental delays, premature birth, crossed or lazy eyes, family history or previous injuries) more frequent exams are recommended. A child that wears eyeglasses or contact lenses should have his or her eyes examined yearly. Children’s eyes can change rapidly as they grow. 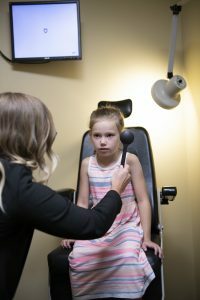 The Saskatchewan Government covers the cost of an annual eye exam for every child under the age of 18 through their government issued health card?? Call our office at 306-651-3331 to book your child's annual eye exam today!